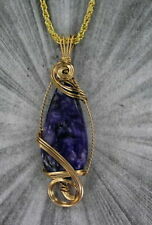 THIS IS A CHAROITE GEMSTONE IN A HANDCRAFTED 14KT ROLLED GOLD SETTING. 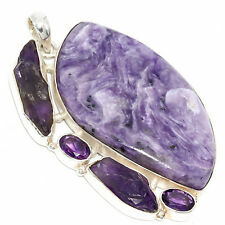 CHAROITE IS A RARE STONE ONLY FOUND IN RUSSIA. tHE STONE 50MM. MORE GEMSTONE PENDANTS HERE. FREE in the US. From United KingdomMetal: Sterling SilverStyle: PendantLength: Less than 13"
It instills a sense of peace and harmony with the divine flow of life and destiny. Charoite is a stone of spiritual transformation, allowing us to understand and heed the lessons we have brought upon ourselves and opening us to see spirituality in others and to recognize our connection with the All. 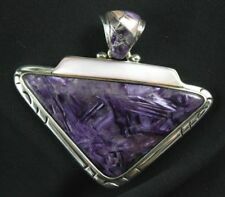 A superb Chunky Sterling Silver & Siberian Charoite Pendant on a Sterling Silver Chain. Superb Colour, This Rare Stone is only found in Siberia and this piece has been set in a generous Sterling Silver Setting. JAIPURGEMS15 are Wholesale Supplier of all type of Gem Stones, precious, semiprecious stones. From IndiaStyle: PendantTheme: Special OccasionLength: Less than 13"
Stunning Solid Sterling Silver & Charoite Pendant with Copper & Brass Plated Highlights over the Silver, giving the appearance of Rose Gold & Yellow Gold. The Cherolite is a really striking stone. Size of the pendant is 3.5cm long. We assure you that we will resolve any kind of issue or concern you may leave. We assure you that we will resolve any kind of issue or concern you may leave. From IndiaStyle: PendantTheme: BeautyLength: Less than 13"
From IndiaStyle: ChainTheme: BeautyLength: Less than 13"
Ending Apr 28 at 7:45AM MYT4d 3hTop-rated sellerFrom IndiaStyle: PendantTheme: BeautyLength: Less than 13"
Style: PendantTheme: Special OccasionLength: Less than 13"
Purple Charoite Gemstone Pendant 925 Sterling Silver Hand Made Jewelry 1.2"
Ring Size Chart. We believe thatbeautiful jewelry shouldn't cost the earth, nor should it be mass produced orrun of the mill. All our jewelry is 100% naturalconflict free. Exclusive Designs. FIRST ITEM. 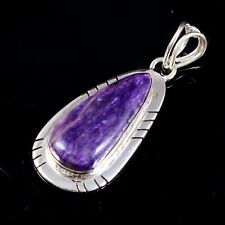 Ending Saturday at 7:10AM MYT3d 2hTop-rated sellerFrom IndiaStyle: PendantTheme: BeautyLength: Less than 13"
Charoite, Amethyst Gemstone .925 Silver Fashion Jewelry Pendant 1.8"
Style: PendantTheme: BeautyLength: Less than 13"
Most of our gemstones are genuine. We will be happy to resolve any issues you may have in a cordial and friendly manner. Otherwise deal is final. All products are quality checked. Most of our gemstones are genuine. We will be happy to resolve any issues you may have in a cordial and friendly manner. Otherwise deal is final. All products are quality checked. R eturn Policy. Ending Thursday at 7:18AM MYT1d 2hFrom IndiaStyle: ChainTheme: BeautyLength: Less than 13"
Ending Apr 28 at 12:57AM MYT3d 20hTop-rated sellerFrom IndiaStyle: PendantTheme: BeautyLength: Less than 13"